Breast cancer is the most frequently diagnosed cancer for women, about 182,000 cases each year and over 40,000 deaths annually. A new study suggests that it may be possible to prevent almost half of these deaths. Nearly 15,000 women had a treadmill test to determine their fitness level (or peak aerobic capacity). 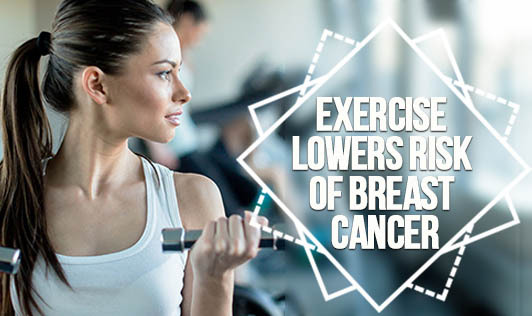 After 16 years of follow-up, researchers found that women who exercised enough to reach "moderate fitness" had a third (33%) fewer breast cancer deaths compared to the low-fit women. Highly fit women had 55% fewer breast cancer deaths compared to low-fit women. Those who had a below-average fitness level were 3 times more likely to die from breast cancer compared to women with a peak aerobic capacity. Or vigorously exercising for 20-30+ minutes, most days of the week. Women need to exercise briskly for at least an hour daily for best results in preventing cancer. The only side effect from this kind of medicine is that you will probably look better, feel better, and live longer! A lump or thickening in or near the breast or in the underarm that persists through the menstrual cycle.